The economy has tanked. Our homes aren’t worth anything. You can’t find a job in this county. And everything is so expensive! These are the messages we have been receiving over the past several years and while it hasn’t ALL been doom and gloom, let’s face it: financially speaking, the last decade hasn’t been good. There is hope, however, and in recent months, there have been some indications that things are starting to get better. In the midst of our county, state and country’s slump, many businesses and organizations have changed with these times to be more inclusive, providing less specific and more generalized services and are becoming more holistic. 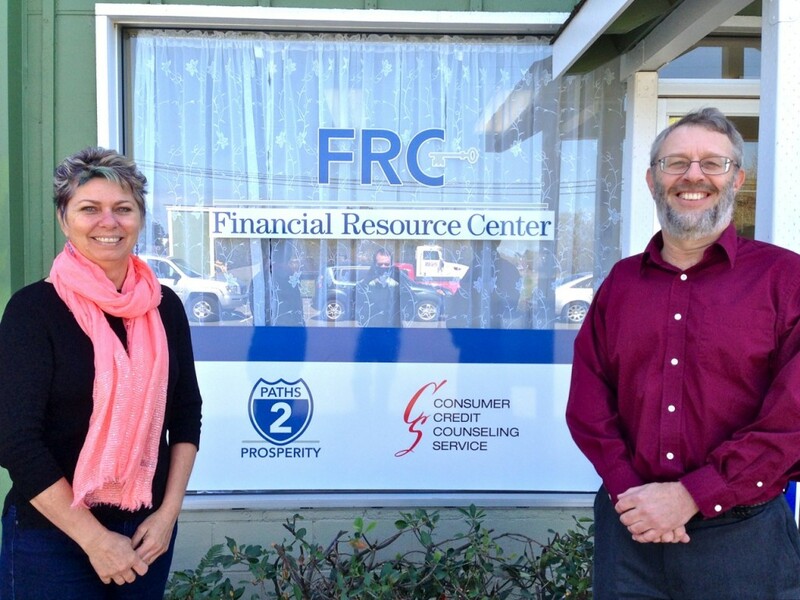 This was the impetus for Consumer Credit Counseling Service’s decision to rebrand itself the Financial Resource Center. The FRC, for short, is not just a debt company anymore. Actually, it never really was. Rosie Wentworth and Winchell Dillenbeck at FRC. Back in 1985, there was a small group called the Everyman’s Center (which later became the more politically correct EveryONE’s Center), which was mainly a crisis call-in center which provided health information, services and workshops. The name was changed to Community Services of the North Coast in 1988. The idea was always a simple one–to help people in the community through counseling and education. That year, the founders, Winchell Dillenbeck and Charles Riche, drove their quintessential hippie-mobile, (a beat-up, old VW van) from Humboldt to San Francisco (or bust!) to attend a regional conference for agencies that were specifically helping folks with their debt. Thus began the time where credit counseling began to take over all other types of counseling within the agency. The organization, which attained non-profit status in 1990 and became Consumer Credit Counseling Service of the North Coast, has had many Arcata locations (as well as Ukiah and Crescent City satellite offices.) It was originally just one tiny office on the Plaza. It then migrated to the blue house across from Los Bagels (where Arcata Scoop is now.) Next, the agency moved back to the Plaza in a spot over the Big Blue Café (which was then the Eureka Baking Company.) Rosie Wentworth, the present program development director, who has been with the agency for 17 years, recalls her times in that office. “We used to set up a circle of chairs in the hallway to hold workshops and at times, because we needed more space, we would counsel clients at the café downstairs!” Executive Director Dillenbeck remembers using an old school postal scale for any office mailings, as well as keeping client records and counseling schedules with pen and paper. “It wasn’t until about ’94 or ’95 when we got our first computer,” he said. “And at that time we had a quasi-network installed, which was definitely not state of the art!” In 2000, the agency made its last move to its current location on 11th street. Education, which is the latter part of the FRC’s mission “supporting change, empowering people and educating the community,” has been a strong focus of the agency right from the beginning. One of the first workshops was held at College of the Redwoods for a group of dental hygienists who wanted tips on living on a budget while in school. The Coast Guard contracted with the agency as well to keep informed on ways to have a viable savings plan. Wentworth, who also has a background in mental health services, these days, teaches classes throughout the community—in schools, for tribal groups, social service agencies and other community groups. She recalls that the counseling services seemed to grow out of the workshops. “People really wanted that one-on-one experience and the sessions also helped to enhance the classroom aspect as well.” In addition to working with clients to pay down debt, create and maintain budgets and read and understand their credit reports, in 2005 the agency also became a government mandated bankruptcy counseling provider and in 2009 took on housing counseling and a representative payee—or bill pay service—for those with mental health diagnoses. What began as more of a social service agency, has come full circle to providing the same kinds of “help” for many members of the community. The FRC is now (as it was before) a place for those who want to become educated, understand credit scores, get rid of debt, learn how to create a spending and savings plan, explore bankruptcy, save a home or buy a new one, or simply get bills paid. The French have a saying, “plus ça change, plus c’est la même chose” or “the more things change, the more they stay the same.” It’s certainly true with the newly-minted Financial Resource Center. It has made this change to serve the needs of the community. Indeed, it has been doing just that since the beginning. This entry was posted on Tuesday, April 2nd, 2013 at 1:34 pm	and is filed under Opinion. You can follow any responses to this entry through the RSS 2.0 feed.